Tooth fissures are deep pits and grooves on the surfaces of the teeth. They are particularly common in children and teenagers and can often cause cavities in the back teeth (molars) where they are normally found. As tooth fissures are very narrow it is difficult to clean inside them when you brush your teeth. Toothbrush bristles are too thick and do not reach down into the fissures. Due to this, bacteria slowly builds inside the fissure causing it to deepen and widen – eventually turning it into a cavity. Fissure sealants are a preventative dental treatment which can be very effective in helping to protect young teeth. A sealant is a clear, plastic material placed onto the surface of your teeth to help protect it and prevent any bacteria from entering the fissures. Sealants can be applied to any tooth with pits or fissures, provided the surface is sound and there are no previous fillings. They are most commonly applied to the molars and pre-molars and are used in children, teenagers and also adults who are at a higher risk of developing fissures. Sealants can be applied to baby teeth if there are deep pits and grooves. It is recommended that a sealant is applied as soon as possible after the adult teeth have erupted, but it is important to ensure the enamel on your teeth has fully matured before application. We can advise you if and when sealants are required in order to protect your teeth. Applying a fissure sealant is quick, easy and painless. No anaesthetic, drills or needles are required. 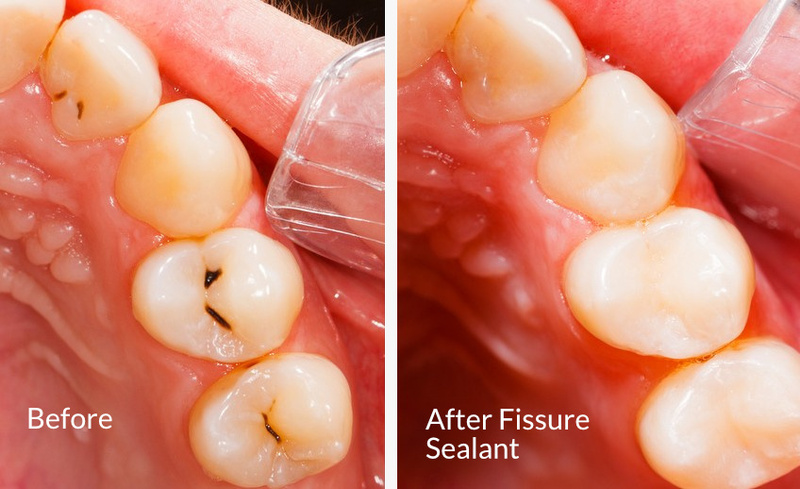 A fissure sealant can be applied by a dentist or a dental hygienist. The tooth will be cleaned and dried and wrapped in cotton material to keep it dry. The tooth will be abraided slightly to help the sealant stick. Again your tooth will be rinsed and dried. The sealant will be applied and hardened under a special UV light if required. Application of a sealant will only take a few minutes per tooth. It is widely agreed that sealants are a highly effective way of helping to prevent decay in fissures. They are particularly useful in protecting young adult teeth between the ages of 6-14 years when cavities are most common. Like a normal filling, a fissure sealant can last for up to ten years or more – provided that it is looked after and regularly checked. Make sure you attend regular dental check-ups so that any damage or wear can be detected early. If the sealant is damaged or falls out it can be easily replaced.